It’s not every day that a Pulitzer Prize winner and New York Times bestselling author finds his way to the Capital Region. 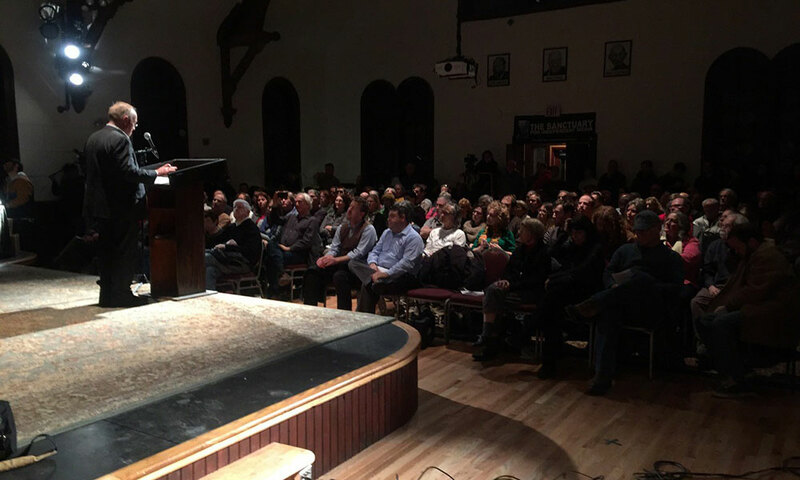 On Nov. 10, Chris Hedges, a notable—and decidedly controversial—journalist, author, activist, educator, and ordained minister spoke to a packed house at the Sanctuary for Independent Media in Troy, N.Y. 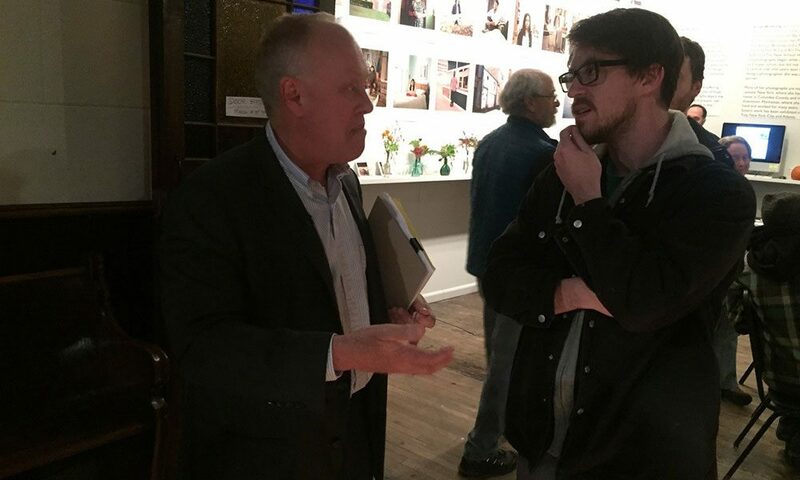 The evening started with Hedges taking part in a pre-talk fundraiser and gourmet dinner to support the building of radio transmitters in Albany and Schenectady. The goal of the initiative is to expand the reach of the Sanctuary’s radio station, WOOC 105.3 FM, and create a new grassroots radio network. 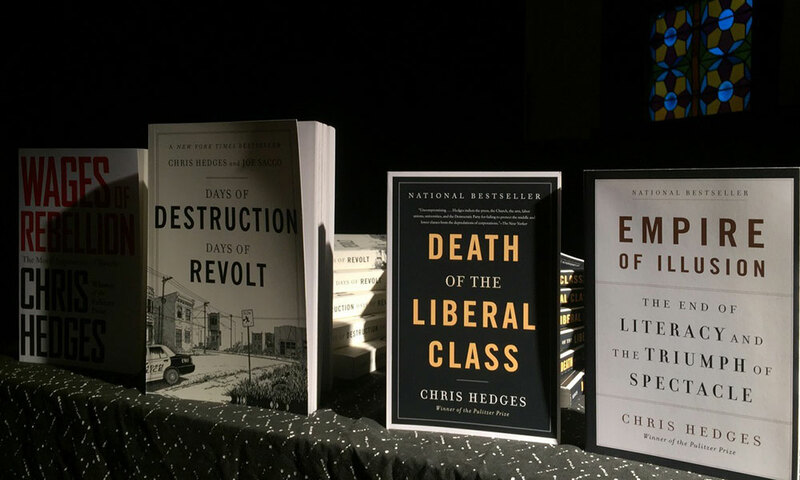 Hedges took the stage and spoke, uninterrupted, for just shy of 90 minutes to an audience that listened attentively as he analyzed where we are now, politically, how we got here, and what can be done about it. He then took questions from the audience and didn’t stop until every one had been answered. Only then did he sit down to sign books and talk to audience members who had lined up to meet him—including Saratoga Living. A minister’s son, Hedges grew up in Schoharie but didn’t get to enjoy the pleasures of the region like the race course or the Spa State Park, he told us. His only experience in Saratoga Springs was when he visited the backstretch workers at the track to do research for a New York Times article published in 2000. Hedges has also long been involved in teaching college-level courses to maximum security prisoners in New Jersey. He got his start through a friend, who was the head of the history department at the College of New Jersey, who’d been buying books and teaching classes that offered no college credits to the prisoner-students. His friend had had a hard time recruiting professors; and Hedges had some time between turning in a manuscript to his publisher and going out on a press tour, so he used it to start teaching in the program. It became a regular thing, and eventually, New Jersey launched a college credit program for prisoners, and he switched to teaching bachelor’s-level students through Rutgers University. “They’re amazing students; dedicated, work hard, a kind of elite within the prison; they turn their cells into libraries,” Hedges told SL. Lastly, SL asked Hedges what movements Americans could take inspiration from in the coming years. “The labor movement, the abolitionist movement, [and] the civil rights movement; that’s where we gotta go,” he said.